Syncany is written in pure Java, so it available on a number of platforms. To make the installation process as easy as possible, we’ve pre-bundled distributables for most major operating systems (a Mac OSX bundle is still missing, see open issues). Whenever we release a new version of Syncany, we regenerate these bundles and publish them on the distribution site. On that site, you can find releases and snapshots. Releases are built and published in a certain release cycle (currently: 2 weeks), and snapshots are built with every commit. Feel free to try out both, but be aware that snapshots are very volatile and things might break without warning. Since Syncany heavily relies on Java, you obviously need an up-to-date version of Java installed. And that is about it. No other requirements. Java/JRE >= 7. See Oracle Website Downloads to install Java. Be sure to load the 64-bit JVM if you intend to load the 64 bit Syncany or the gui plugin will not run. bash-completion >= 2 (Linux only). If it’s not installed by default, it’s definitely in the default packages. On Windows, you can either manually extract the Syncany files from the ZIP archive, or use the installer. The latter is obviously more comfortable, but both variants have their reasons. The installation using the Windows installer is easy and very similar to the installation of other applications. Download the latest release from the distribution site (see folder releases). The installer files have the .exe ending. You can’t miss it. Then run the executable and follow the instructions. After the installation, open the command prompt and type sy. 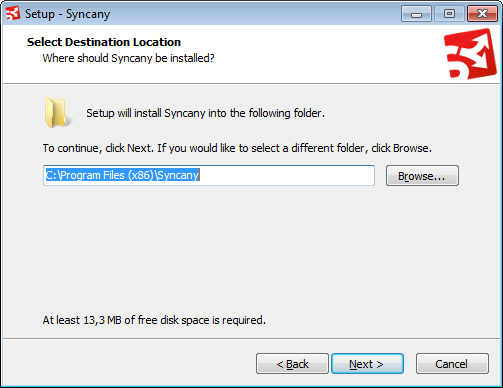 Other than where to install Syncany, the installer will only give you two additional options. If you are not sure what they mean, don’t change them. Add Syncany to PATH environment variable (recommended): If you’re unsure, leave this as is. For Syncany to be available on the command line, the command line will have to know where to look for it. If this option is unchecked, the sy command will not be available unless the installation path is added to the PATH environment variable. Set JAVA_HOME environment variable (recommended): If you’re unsure, leave this as is. Syncany relies on the Java Runtime Environment (JRE) and this variable tells the Syncany commands where to look for it. For Debian-based systems, we provide an APT archive (for installation via apt-get) as well as a way to manually download and install prebuilt .deb-packages (see distribution site). Add the APT archive http://archive.syncany.org/apt/release/ to your additional software sources (this might ask you to confirm the Syncany public key as a trusted key). Once that is done, you can now update the package archives by sudo apt-get update, and install Syncany with sudo apt-get install syncany. After the installation, open the terminal and type sy. sudo sh -c "echo deb http://archive.syncany.org/apt/release/ release main > /etc/apt/sources.list.d/syncany.list"
Download the latest release Debian package from the distribution site (see folder releases). Double-click the .deb-package and click “Install”, or type sudo dpkg -i syncany_<version>.deb from the command line. Homebrew notes: Since Syncany is still alpha software, it cannot be installed from the official Homebrew sources. Therefore we provide the needed formula on our own until we reach beta. The command above installs the most recent (pre-)release. If you want to install the bleeding edge version simply append --HEAD to the previous command. If you like the Syncany daemon to start at system startup, install the provided LaunchAgent following Homebrew instructions. If you just want to try Syncany for a few minutes, we provide it as a containerized Docker application for Syncany. If you’ve installed Docker already, you can use the syncany/release repository. In addition to the releases, we also provide snapshot versions of Syncany. Snapshots are bundles that reflect the cutting edge state of development. They are created for every single commit in our versioning system, so updates come very frequently – sometimes up to dozens of times per day. Unless you’d like to test a new feature before everyone else or you are asked by a developer to install that version, it is highly discouraged. Things might break. They might be incompatible to previous versions. Or it might not work at all. If you’re sure you want to install a snapshot, the process is very similar to the steps above. The only thing that differs is the file or access channel where you get the installer/package. For Windows, download the latest snapshot installer from the snapshots folder. For Debian/Ubuntu, use the Syncany APT archive. For Arch Linux, use the Git package on AUR. For Docker, use the Docker snapshot repository (syncany/snapshot). 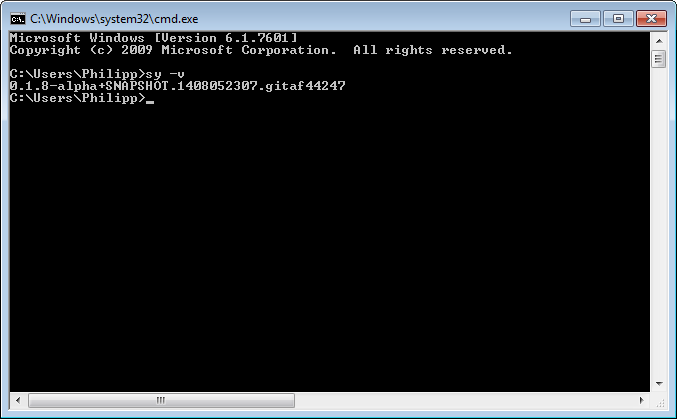 And for other operating systems, download the latest snapshot .tar.gz/.zip from the snapshots folder. Syncany hosts its code on GitHub, so if you want to compile Syncany from source, you definitely can – and we encourage you to do so. Since this is a user manual, however, we don’t want to go into too much detail about the build process. There are details about building available on the Wiki page. This compiles and installs the Syncany command line client to syncany-cli/build/install/syncany/bin/syncany. You can run it from there.